This reveals that two of the RAF’s six E-3Ds have been unserviceable, which was not previously public knowledge. It also adds another aircraft to the RAF inventory that cannot be refueled by its Voyager aerial tankers, as like the C-17 Globemaster, P-8A Poseidon, RC-135 Airseeker and E-3D AWACS, because they lack refueling booms. Calling on allied tankers is always possible, but the RAF should add booms to its Voyagers so they can refuel aircraft only fitted with USAF-style receptacles on their top fuselages. It is not known why the RAF’s Voyager tankers weren’t ordered with booms in the first place, as are those of all other operators. 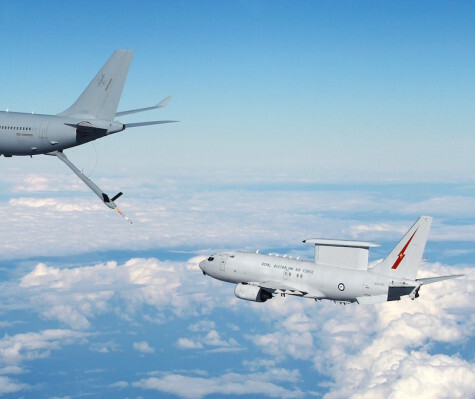 The British Ministry of Defence announced on March 22 a nearly $2 billion procurement of a fleet of five Wedgetail E-7 airborne early warning and control (AEW&C) aircraft from Boeing. With British aircrews already training on the Wedgetail in Australia and Defence Secretary Gavin Williamson confirming on October 2, 2018, that discussions with the U.S. manufacturer were underway, the procurement was seen as a foregone conclusion. That the British opted for a single-source avenue rather than float a competitive tender, however, drew complaints from both the Parliamentary Defence Committee and rival manufacturers including Airbus and Saab. But with the Royal Air Force’s fleet of E-3D Sentry AEW aircraft suffering from groundings, low serviceability rates, and high maintenance costs, the need to replace and improve an eroding situational awareness/command-and-control capability appears to have prompted officials to pursue a faster course. The E-3D Sentrys were earlier planned to remain operational through 2035 as per Britain’s 2015 Strategic Defense and Security Review. However, a proposed GBP2 billion upgrade (the airframes of these aircraft are based on the 1950s design for the Boeing 707) was instead reduced to a concept study in order to achieve savings and generate RAF near-term efficiencies. The Defence Ministry undertook its own market analysis of the AEW&C options in 2018 and concluded that the E-7 represented the best value for money option. The aircraft purchase also brings added value in terms of localized work share with Cambridge-based aerospace company Marshall Aerospace and Defence Group, set to convert the Boeing 737 NG airframes to the E-7 AEW standard. Boeing’s E-7 is based on a standard 737-700 airframe outfitted with an advanced electronically scanned array (AESA) radar and 10 mission crew consoles capable of tracking airborne and maritime targets simultaneously with 360-degree coverage. The British E-7s will be based on the Australian-configured model of the aircraft. The purchase thus allows for greater interoperability with close ally Australia, which, like the U.K., will be operating fleets of P-8 Poseidon maritime patrol aircraft and F-35 Lightning II combat aircraft across the coming decades. The United Kingdom today announced that it has signed a contract with Boeing to acquire five E-7A Wedgetail Airborne Early Warning and Control aircraft. Minister for Defence, the Hon Christopher Pyne MP, and Minister for Defence Industry, Senator the Hon Linda Reynolds welcomed the announcement and said the acquisition represented an acknowledgement of the world-leading nature of the Wedgetail aircraft. “The Wedgetail is a true Australian success story – designed for the Royal Australian Air Force with investment by the Australian Government and the support of over 200 Australian companies,” Minister Pyne said. The UK acquisition is also expected to be a significant win for Australian defence industry. “The UK acquisition is expected to deliver 100 jobs to the Brisbane and Newcastle based staff of Boeing Defence Australia, taking advantage of their world-leading capabilities in systems and software engineering and deep experience in Wedgetail support, including ground-based aircrew training,” Minister Reyonlds said.